There are so many things I have learned since having grandchildren. I have learned that it's a very different world from the one I grew up in or even the world my children grew up in. I have learned that kids start going to school when they are just babies and learn to read in kindergarten or before. We went to kindergarten half days and learned some of the letters. I think everyone spends way too much time looking at little screens and not enough time outside. I have gotten into the technology age myself and I have learned a lot about computers and phones, but I didn't know about clearing the history on my phone to save the battery until the kids told me. I don't know a lot but I can navigate as much as I need to. Sometimes I wish I could just go back to a time without all this information. My brain is full. I can't even imagine what things will be like in the next 10 years. This year they ordered Praying Mantis egg cases. They put the egg case in the net habitat they used to raise the butterflies. 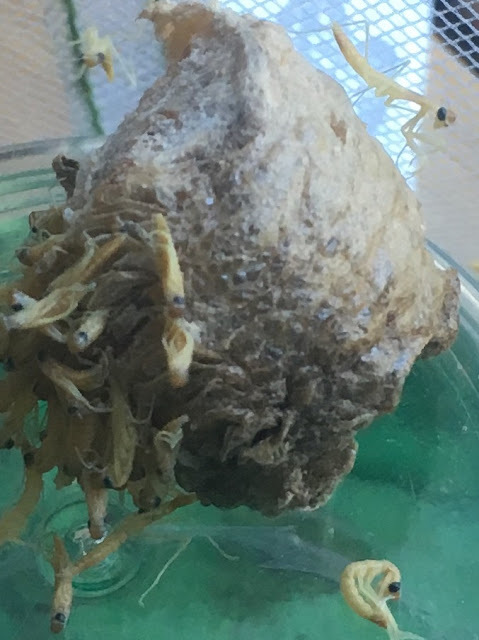 A Praying Mantis egg case. They waited six weeks for the eggs to hatch. 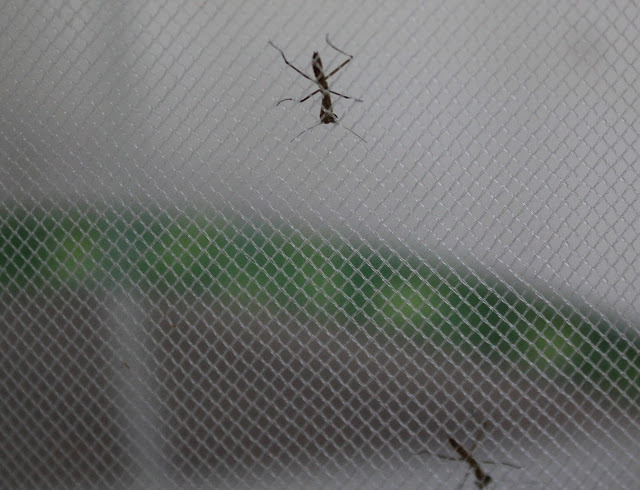 Then one day, there were hundreds of little Praying Mantises crawling around. The plan is to release them in the garden after they have grown for a while. I imagine most of them will get eaten by birds and bigger insects, but it was fun to see them hatch. I took a few home. I thought I would try to raise them to adult size which is 2-4 inches. I found out they have to eat fruit flies or aphids. I have no idea how to catch a fruit fly. I found some little ants and put them in with the mantis. They get into their praying position but I haven't seen them eat yet. I have a feeling they may not make it, but time will tell. I started with five and now I have two. I think they may be eating each other. I can't even imagine what my grandson will want to hatch out next, but I'm sure it will be interesting.